If your dad or mum is a firefighter, there’s oodles of good picture books about their exciting job (firefighters are high on the list of thrilling topics for pre-schoolers). However, have you noticed that there’s not really many books about the less exciting jobs? Perhaps being an administrative assistant, a plumber, a public servant or an engineer is as exciting as a firefighter, it just depends on the way you present it. 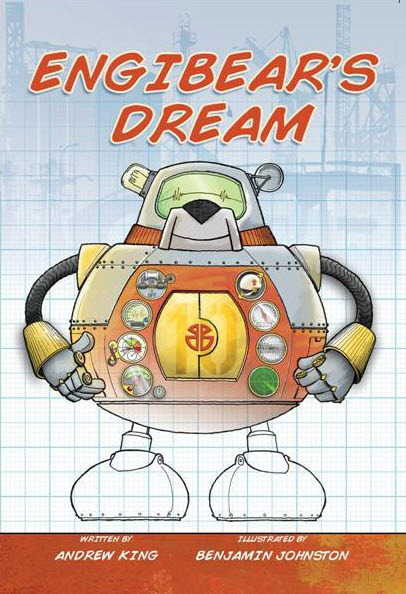 Author Andrew King and illustrator Benjamin Johnston have created a new kind of hero – an engineering bear – in Engibear’s Dream. The story is about Engibear, who wants to build a robot (also known as a ‘bearbot’) to help him with his work. Early versions fail, often spectacularly, but Engibear keeps trying. He tweaks his designs, makes some changes and each time his bearbot improves until finally he perfects it at Bearbot Type Ten. Engibear built it quickly, he wanted results. And got quite a surprise when he heard the KABOOM! The joy of this book is in the illustrations. Johnston has brought Engibear and all the Bearbots to life. Terrific cartoon-like colour drawings, each bursting with movement and action, are overlaid on grid paper. 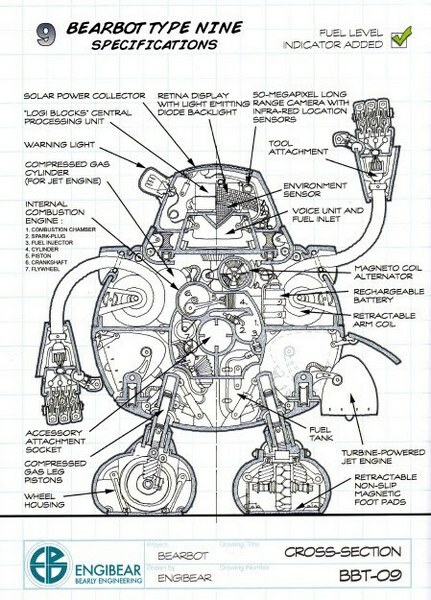 It’s a clever technique that allows children to differentiate between the plan for each Bearbot and the built version. The highlight is the last few pages where the author has included double-paged spreads of the Bearbot Types, each with their particular specifications and improvements noted. I suspect that there are many kids who will pore over these last few pages, ‘reading’ them again and again. Special mention must also be made of the end-papers. I particularly like a book that includes illustrated end-papers and Engibear’s Dream has the best I’ve come across in a long time. The inside of the front and back covers show a three-dimensional map of Munnagong, Engibear’s home town. It has all the detail you would expect in an engineering book and there’s lots of fun to be had locating places of interest in the town (from the Munnagong Opera House to the International Space Centre). Engibear’s Dream is not the first book to deliver a ‘don’t give up’ message but it is the first to do it in a unique way, geared to inquiring little minds. The book is suitable for children aged three years and over. Find Engibear’s Dream online at The Engineer’s Bookshop for $24.95 plus $3.30 postage.